For parents whose child has special needs, there can be concerns about the ability of child care providers to effectively manage a child’s needs. For Military Families this can be of additional concern with frequent relocation. What are the military-sponsored options for families whose child has disabilities? According to Floyd and Phillips (2013), Department of Defense (DoD) operates the largest employer-sponsored child care system in the United States. It’s widely considered to be a model program, with rigorous standards regarding facilities, provider training, and accreditation. Services at DoD-run facilities are subsidized, with each branch of service setting fees based on overall DoD policy. On- and off-installation care in Licensed Family Child Care. Providers-usually military spouses-are trained and certified by the services, and the homes are inspected according to DoD and service requirements. Provides an alternative to CDC care if CDCs are full or if families’ needs are not met by CDC. Some Family Child Care may offer overnight, emergency, or infant care, for example. School-Age Care On- or off-base providers, including CDCs, Family Child Care, youth centers, community-based nonprofits, or schools. Providers must be certified or licensed, and inspected, by the DoD or the state. Provides before-school, after-school, and summer/holiday care. Off-installation child care providers licensed and inspected by the state, including child care centers and family child care homes. Military Child Care in Your Neighborhood providers must be accredited to ensure quality comparable to a CDC. In practice, service branches may waive this requirement if no accredited provider is available. Subsidizes the cost of off-installation care if on-installation facilities are full or there is no installation nearby. Operation Military Child Care offers fee assistance during deployments or (for Navy) ship duty. In addition, each branch of service may offer additional programs; parents should find information on their local installation’s website. Demand for these high-quality services is generally greater than availability and for some CDCs, parents have been advised to apply for openings well before a child is born! Wait lists for on-installation full-time care, and low availability of part-time care are a reality. In addition, many military families live too far away to use on-installation care. To cover these situations, “Operation Military Child”, (external link) and “Military Child Care in Your Neighborhood” (external link) were established to provide subsidies for civilian-provided child care that meet certain standards. When a child has special needs, parents may have concerns about the ability of child care providers to manage those needs effectively. All branches of service have developed programs to determine appropriate child care placement for children with special medical and/or educational needs. The processes work to provide “reasonable accommodation” but do not guarantee a placement. The placement process only applies to child care and youth programs operated by DoD. Each service uses different designations for their programs but the process is broadly similar across the three services. Each installation has a team to determine placement. Members may consist of the installation EFMP manager, the Child, Youth & School Services Coordinator (CYSS), an appropriate installation medical provider, parents, an installation staff judge advocate (military legal representative), and other members as appropriate. For instance, the parents may choose to have their own medical personnel participate on the team. Sometimes additional CYSS program staff may be brought in. Installation commanders are always members of the core team, although in practice they usually appoint designees. The titles of each of these positions will vary from service to service, but the important point is the membership of these teams: command, legal, medical, educational and program points of view are all represented. These teams make recommendations to the parents for placement based on the child’s requirements and the programs’ abilities to provide reasonable accommodation. Recommendations that don’t meet parents’ expectations may be reviewed by a subcommittee of the placement team to ensure that all placement options have been explored. This is not an appeals process: the subcommittee usually consists of members of the original team. 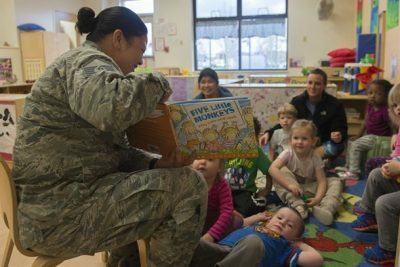 Installation command has the final say on placement for a DoD-operated child care program. It is important to help families understand that funding alone can’t be a justification for not supporting the child in these services. How Can Parent Centers Assist Military Families to Get Appropriate Child Care Placement for their Child with Special Educational/Medical Needs? Help families understand that the childcare center is not required to provide a specialized program for their child (if the accommodations the family is requesting would alter the basic program or require additional 1:1 support the centers can deny the child). As parents evaluate a child care placement, help them look at future benefits the child will gain from a program, and what skills/behaviors he/she can learn that will help them in school and future childcare and educational settings. Air Force: Inclusion Action Team (IAT). Will usually consist of the installation’s Special Needs Coordinator (an EFMP position), a medical provider assigned to the installation, Child and Youth Program personnel. Parents may attend planning meetings, but are not considered part of the IAT. Parents have the option of bringing additional professionals to an IAT planning meeting, at their own expense. Coast Guard Special Needs Resource Team (SNRT): Addresses the placement of children with special needs in the CDC/FCC homes taking into consideration developmentally appropriate environment, adult/child ratios, group sizes, and any necessary program adaptations. The team is comprised of the Family Resource Specialist, CDC Director/FCC Provider, Coast Guard Health Care Provider, and parents of the child involved. Families shall be allowed to have a knowledgeable professional accompany them to the team meeting, at their cost. Recommends a placement, which accommodates, to the extent possible, the children’s individual needs, parents’ mission requirements, and parents’ preference for care setting. b. Facilitate the placement of children into the least restrictive environment. c. Consider developmentally and/or physically appropriate environment: adult and child ratios; risk assessment; group sizes; and necessary program adaptations. Marine Corps Special Needs Evaluation Review Team (SNERT). The SNERT consists of qualified personnel who make an assessment of the accommodations necessary for a child with special needs to participate in Marine Corps Children, Youth, and Teen Programs (CYTP) and to determine the most appropriate placement for the child. Children who require medical or educational intervention, assistance, or other accommodations are eligible for services. Upon request for services, the SNERT will make an assessment of the accommodations necessary for a child with special needs to participate and determine the most appropriate placement. More information on the SNERT is available in Marine Corps Order P1710.30E, Marine Corps Children, Youth and Teen Programs, (external link) June 24, 2004. Application forms for on-installation child care and youth programs are usually available on the installation’s website. DoD offers an online childcare search tool (MilitaryChildCare.com -external link) for all branches of service. MilitaryChildCare.com (external link) also recommends child care placement for children with special needs through Inclusion Action Teams, which are similar to SNAP, SNERT, and SNRB and follow protocol appropriate to the parent’s branch of service. For off-installation options, parents are usually directed to the installation’s Resource and Referral program. Resource and Referral contact information for each installation is available at MilitaryINSTALLATIONS (external link). Child Care Aware of America (external link) is where families can get information and applications for Operation Military Child and Military Child Care in Your Neighborhood. Information from Military OneSource on DoD programs for families who have members with disabilities (external link). Address Awareness and Availability Barriers. (5) Washington: GAO. What are military families experiencing with the TRICARE ABA service changes?